High-fired porcelain vase with shiny gold accents. 8.5"W x 2.5"D x 9.8"T. Imported. Vase design inspired by Gala, wife and muse of Salvador Dali. Unglazed matte porcelain. Clear glazed interior. 6"Dia. 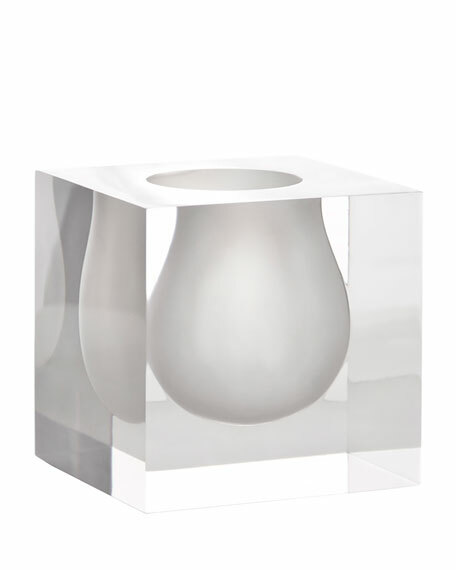 x 10"T.
Vase design inspired by Gala, wife and muse of Salvador Dali. Unglazed matte porcelain. Clear glazed interior. 6"Dia. x 10"T. Spot clean. Imported. Handcrafted vase. Lead-free crystal. 6"Dia. x 8"T. Imported.